Strike a Pose!Supermodel Christie Brinkley celebrated with friends and family at her 65th Birthday party on Tuesday, January 29, 2019 in New York City. 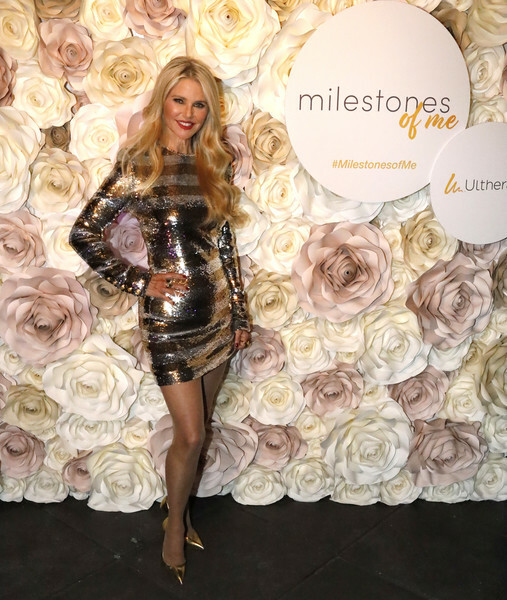 The exclusive bash, held at the rooftop of the Gramercy Park Hotel, also served as the launch of her new Ultherapy campaign - Milestones of Me. The supermodel credits Ultherapy as an important part of her beauty and self-care routine. Christie Brinkley kept the shimmer going with a pair of pointy gold pumps. Christie Brinkley glitzed up in a gold and silver sequined dress for her 65th birthday party.